Priya Bhatt reviews Priyadarshini Govind’s BharataNatyam performance in San Jose, CA, USA on Nov 2, 2008. How does one write a review for something that presents as boundless a view as the horizon? That was what Priyadarshini Govind’s performance in San Jose, California organized by the South Indian Fine Arts Council was; so one can only act as record-keeper, not reviewer. In an ensemble of rich maroon tones offset by a richer gold, Priya started off with a Mallari in Gambhira Nattai ragam, with an twist of Mishra Triputa thalam, though there was nothing gambhira about it; it was radiance through and through. Following this up with an Alaripu in Tishram was an unpredictable choice, given that the Tishra Alaripu is a student piece. Priya however, flavored this beginner piece with intricacies of her own: She angled her anjalis and lunged into poses; brought a freshness to the incessant dittitais with dramatic pauses and enhanced the basic steps with fuller hand movements. The Tishra Alaripu wouldn’t have recognized itself. Shadakshara Kautwam was the next piece, a celebration of Shanmukha-bhakti in Shanmukhapriya ragam. Priya was now a peacock, now a vel, now a bhakta, now benevolent Muruga Himself, and then a dancer. The Nataikurunji varnam that followed transcended from being the formidable piece-de-resistance to a happy experiment in at once defying and challenging norms, of choreography, of age and energy. Priya Govind’s portrayal consisted of two distinct bhavas; the majestic dancing Nataraja and inexplicably, the navarasas within the Shringara- that is quintessential Priya Govind, to catharsize the bhava into a moment, or energize it to have a life of its own. Watching Priya Govind perform is a study in contrasts- there is a quietness to her drama and an explosion in her restraint. Priya makes every second last a beautiful eternity and every fleeting experience transform into an undying memory. And the hand-in-glove chemistry with the orchestra is simply silk. Shaji Lal was masterful as her nattuvanar. The vocals, violin and mridangam were par excellence as an inspirational force in Priya’s dancing. Great idea to bring a technician from India as well, he did a great job of getting us to see the Light. A tussle between loyalties, to one’s own self and to one’s doctrine, was superbly emoted by Priya in the first item after the intermission: Shivadeekhsha, where the young Shaivaite girl reluctantly turns her Vaishnavite lover away. That Priya can choose this piece, analyze the emotions and then be this nayika is proof that the divine exists, and aids and abets in a woman’s path to self-realization. She’s the only one who can get her audience to go past her resplendent blue-gold-red costume-with-long-melaka-down-the-back to create an illusion that hey, she’s actually dressed in simple cotton, has just taken a dip and is dripping wet as she walks back home, ready for her morning pooja. One almost shivers in reaction to the water! ‘At that moment, how can you restrain yourself?..’ –Indeed, how can one, faced with Priya Govind’s alluring incarnation of a young maiden caught up in the romance of a meeting with an attractive young man, in Appudumanasa. Now, was it the nayika or Priya herself urging you to let all restraint drop? How can one merge and emerge at will like this? The folksy tale of Kanna’s antics including the one where he manages to get close enough to a girl and pinch her on the pretext of hearing her sing was like a fond memory- Priya managed to invoke a familiarity instead of leaving us feeling like mere spectators. Suddenly, you want to be with this child Krishna. No, you want to be the gopi that admonishes him. Then again, to be the girl that gets her cheek pinched would be so good! The highlight in terms of technique in all the three abhinaya pieces was that Priya moved about a lot. However, with Priya, the 6×6 feet of space that the nayika claims as her stage metamorphosizes into a passage of suspended time. The mark of an expert dancer is to be omnipresent; not ‘cover’ space on stage, a feat that Priya Govind instinctively achieves. The solo rendition of the Kalinga Nartana ‘poem’ like Priya Govind called it, was nirvanaic in its impact on the audience. The attention to detail blows one away: the gait of the Naga-wives was distinct from one the egoistic Kalinga used. The prancing of Krishna in the Yamuna was beautifully blended to an ongoing fight: Priya Govind used nritta korvai-lets with patakas to depict Krishna swimming, and then He Swung Kalinga around to dance on him. Yamuna herself came to life in the rolling waves in the beginning. And all that energy comes to a head and then just black-holes into a pose when Krishna pushes Kalinga’s head into submission. With Priya, every second of time, pause, pose, and look is seared with a mark of its own. She herself has said that BharataNatyam is not just bhava, mudras and movement; it is a language that she uses to communicate. Indeed, with Priya it would not matter if it had it been a Rajender, Anagha or Aparajita or even a Jill, Jane and Bob in the audience instead of a Jaya, Sri and Ravi. Brindavani Thillana was a delight to watch, even though one suspects it was an abridged version. Priya Govind’s dancing is as effortless and instinctive as a spontaneous cry of joyful surprise. She alone can transcend a walk to Natyadharmi status, and get the most stylized and traditional of steps to transform to a Lokadharmi feel; more proof of her dancing being a study in contrasts. She makes it feel as if getting to samam at the end of a korvai is not just the culmination, but an event in itself that she’s been waiting for all her life; everytime. And that last pose- how can she pack so much energy with her back to the audience and her arms lifted up in alapadmakas? Never mind that- Bhanudas came alive when Priya Govind danced his abhang ‘Brindavani venu vaaze’. O what trickery is this, that a dancer can get you this close to experience heavenly bliss? Priya’s Govind played on His flute while slowly dancing out a tune with his feet, in a tight gyration, and the fact that Priya repeated this at least three times is evidence that she does have her finger on the audience pulse- one always wants more of something good. It was like a painting come alive, when her Krishna mesmerized birds, animals and humans alike. A body to soul experience, truly- Jeevatma to Paramatma. But, but- The biggest draw that Priya Govind has, is the feeling we get that her very breath depends on an audience, that it is drawn because of the audience, and not inspite of the audience as some performers will have you believe. Like the line from the varnam that evening, ‘Namamrita …..jeevana’, Priya Govind makes her audience feel like having them watch her perform is all the sustenance she needs. And this is her greatest asset and lifelong hold over the audience. 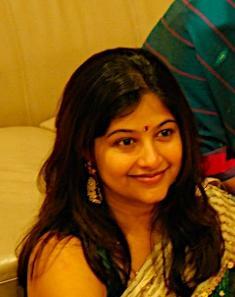 Priya Bhatt is a contract marketer by profession, for software products and services. By passion though, she’s a performer: A background and ongoing interest in Bharatanatyam, with an ambition to do more in theater. Her hobbies include writing, choreography and designing women’s wear. This entry was posted in Features on November 7, 2008 by vpdot. Priya Govind for helping me trace my childhood pal Priya Bhatt through this article on your performance. Hey Rajeshwari.. hopefully that makes two of us..Its a coincidence that I saw this article today.. by any chance were you from Pestom Sagar – Chembur too? Priya Bhatt was always good at writing I guess.. but this is the first time I am reading it..quite amazed!. and known her since childhood too.. do lemme know if u get in touch with her! please release the audio piece of shadakshara kauthuvam as soon as possible.